We worked with Vee. She was extremely knowledgeable about flowers and what would look good together. She made the most beautiful bouquets with matching boutonnieres. People loved the centerpieces (sunflowers inside white pumpkins) so much that they were fighting over who could take them home. 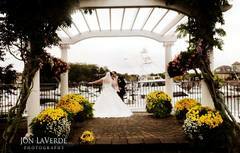 She was great to work with, I highly recommend Vee and Evan's Flowers.